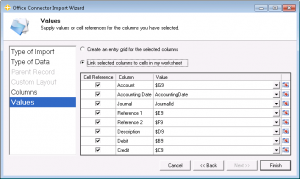 Exercise 3 - Enabling Existing Excel Worksheets For Import - Event 1 Software, Inc. The Name Box is the box that sits above the upper-left corner of the worksheet. Normally, the cell address of the current selection is displayed here. However, a name can be entered in this box to assign a label for a cell or cell range. This label can then be used elsewhere as a cell reference. In cell G9, enter a formula that combines the Company ID and the Base Account to form the full Account Number on each row. Copy the formula from cell G9 down to the remaining rows (G10 through G18). 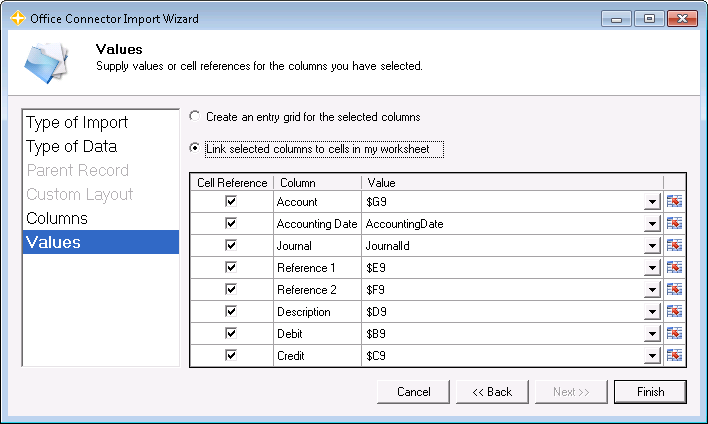 Click cell H9, and then click Import Wizard on the Office Connector toolbar. For Type Of Import, select GL Transaction Import File and click Next. Note - For named cells, you can click the drop-down button and select the cell name. For other cells, you can click the cell-selector icon (far right column) to point and click on the desired cell. Copy the formula in cell H9 down to the remaining rows H10 through H18. Columns G and H could be hidden as they would not serve any value to the end user of the solution. This would also prevent the import formula from being modified, thus breaking the import file. If you plan to add more rows, the range of data in A8:H18 can be converted to a table. As a table, the formulas in columns G and H will automatically copy down to new rows when added. To do this, select the entire range and then select Insert / Table. Consider using Office Connector Query to create simple lists of IDs (Company, Base Account, Journal) that can be used in conjunction with drop-down lists via Excel’s Data Validation feature. Also utilize Data Validation and conditional formatting to ensure data is valid. Note - For more information, please see Exercise 2 - Adding Data Validation To Excel Worksheets covered previously in our knowledge base. Click OK to create the file and then launch the Import Transactions window from General Ledger (it may take a few seconds for this window to come up). Once the Import Transactions – Print Selection window appears, click the […] ellipses for Import File, select the GLTransaction.TXT file, and click Open. Review the General Ledger Import Transactions report when the import has finished.